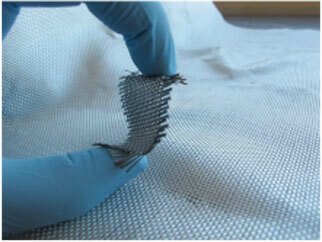 (Nanowerk Spotlight) The future of your shirts, socks and gloves will be electronic. In years to come, wearable electronics will look nothing like even your smallest iPod or mobile phone today. Not only will such devices be embedded on textile substrates, but an electronics device or system could become the fabric itself (see for instance: "Nanotechnology e-textiles for biomonitoring and wearable electronics"). These e-textiles will have the revolutionary ability to sense, act, store, emit, and move – think biomedical monitoring functions or new man-machine interfaces, not to mention game controllers – while leveraging an existing low-cost textile manufacturing infrastructure. We are not quite there yet, though, and researchers have their work cut out for them before you can make video calls with your T-shirt. Here is some recent work that demonstrates the kind of issues scientists are working on today and that will help improve the performance of electronic textile structures. Using atomic layer deposition (ALD) – a vapor phase thin film growth process where a metal organic precursor and a reactant are sequentially exposed to a surface – researchers at North Carolina State University (NCSU) have grown coatings of inorganic materials on the surface of textiles like woven cotton and nonwoven polypropylene. By fabricating an all-fiber capacitor, they show that their coated materials (tungsten coatings on quartz fibers) are sufficiently conductive to perform in simple device architectures. On top of that, they demonstrate a technique to characterize coated fiber systems. "Our research team had previously studied inorganic coatings on polymer textile surfaces by atomic layer deposition, which results in controlled nanocoatings," Jesse Jur, assistant professor of textile engineering, chemistry and science, tells Nanowerk. "From our research team's prior experience in microelectronics, we naturally wanted to show how this process could be used to produce electronic devices on textiles." The consistent results obtained from the analysis demonstrates that ALD is a viable method to achieve well-controlled conductive and semiconductive coatings on woven textiles and fibrous nonwoven materials. A major issue that Jur's team found when starting this work was how to evaluate the transport of charge in their coated textiles. "A standardized method was necessary to compare and contrast conductive nanocoatings on a variety of textile materials" he says. "Methods to do this had not been shown previously. This information would show how the coatings evolve and how they are affected by the textile's construction." 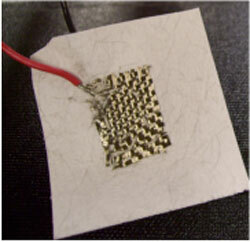 In a recent issue of Advanced Functional Materials (Atomic Layer Deposition of Conductive Coatings on Cotton, Paper, and Synthetic Fibers: Conductivity Analysis and Functional Chemical Sensing Using "All-Fiber" Capacitors), Jur and his team describe a procedure to quantify the effective electrical conductivity of conductive coatings on non-conductive fibrous networks. "Our approach provides reliable estimates for coating conductivity on a range of different fiber structures, and values obtained with this method produce consistent results for films of different thickness deposited on different fibrous substrates," says Jur. To quantify the effective conductivity of the inorganic thin-film coatings on natural and synthetic fibers for their capacitor, the NCSU team applied a 4-probe measurement method. The contact electrodes span across the sample width and establish an approximately linear field along the sample length between the electrodes. "We quantify the effect of an applied normal compressive force on the through-fiber conductance, and conclude that compressive force enhances fiber/fiber contact and minimizes internal contact resistance within the fiber structure," explains Jur. Going forward, the team is now looking at the challenge of how to develop and integrate multiple layers, much like a typical microelectronics device, and scale-up of the process (see for instance: Atomic Layer Deposition of Al2O3 and ZnO at Atmospheric Pressure in a Flow Tube Reactor). Joint projects between the College of Textiles and College of Engineering at North Carolina State University are focusing on these efforts.